On some level, the essential appeal of stamp collecting is simply visual. Collectors love to spend hours staring at their stamps, immersed in the sheer pleasure of the multitude of topics, designs and shapes. Add to this mix creative and unique color combinations, tints and shades, and the visual equation is complete. Such are the stamps issued for the British Empire (British commonwealth, territories, colonies, protectorates, etc.) in the first half of the 1900s: Bermuda, Cayman Islands, Malta, Leeward Islands, Malaya, St. Helena and more. The stamps were beautifully designed and engraved, not to mention the selection of quite distinctive blends of color for the paper on which the stamps were printed and the inks used for the stamp’s images. It has even been said that many of the brilliantly colored issues for these territories pushed the envelope (no pun intended) on color choices and combinations, some possibly just a bit too colorful and bright! 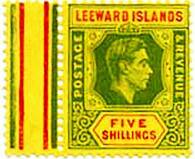 stamps of the Leeward Islands. Montserrat, Nevis, St. Christopher (St. Kitts) and the Virgin Islands. These territories used postage stamps inscribed "LEEWARD ISLANDS"
definitely the most brilliantly colored of the set. 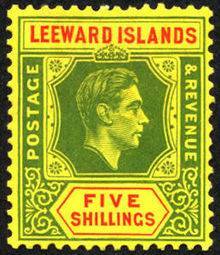 "The KGVI Leeward Islands £1 issues are one of the more complex KGVI stamps to properly identify. If your stamp is Salmon, look at the center color. It will be a Brownish Purple shade. If the color seems to have a reddish tone, it is probably from the 6/44 printing. If you do not see a hint of the reddish color to the brownish-purple, then it is probably from the 12/43 printing……….”, and so on and so on. Bermuda – the British overseas territory in the North Atlantic Ocean, located off the east coast of the United States - can also boast of many creative and intriguing paper and ink color combinations. 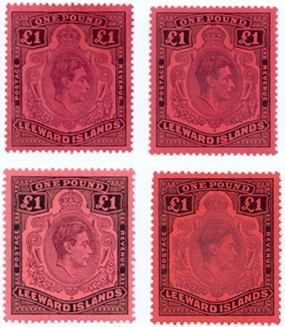 From left to right below, the first stamp is from the 1937 issue and is described as “green and deep lake on pale emerald.” The next stamp echoes the color combination used with the Leeward Islands King George VI £1 issue, “deep purple on red-scarlet.” The two 5 shillings issues, the 3rd and 4th stamps below, have rather “common” color combinations of “green and red on yellow”, but are certainly solid examples of brilliant and colorful British territory issues. As mentioned, the appeal of the colorful stamps issued by the various British territories is as much a factor of the colors of the paper used in the printing as the inks selected to print the stamp images. The blocks and pairs of stamps below highlight the green, bluish-purple, purple, reddish-orange and yellow papers used in the printing process. Some of the territory stamps have almost an iridescent, phosphorus look about them as with these issues from the Falkland Islands, Gibraltar, St. Kitts and British Honduras. What gives these stamps that iridescent effect? They were printed on “chalky” paper, i.e., a type of paper coated with a chalky solution for security purposes. The postmark cannot be removed without damaging the surface of the stamp. Chalky paper produces a more brilliant color impression. And, that brilliance is certainly apparent on stamps printed in “singly fugitive” inks that afford a protection against the removal of postmarks. But the brilliant look of the stamp is even more pronounced on stamps printed with “doubly fugitive” inks which afford an extra precaution against the removal of writing ink used for pen cancellations. 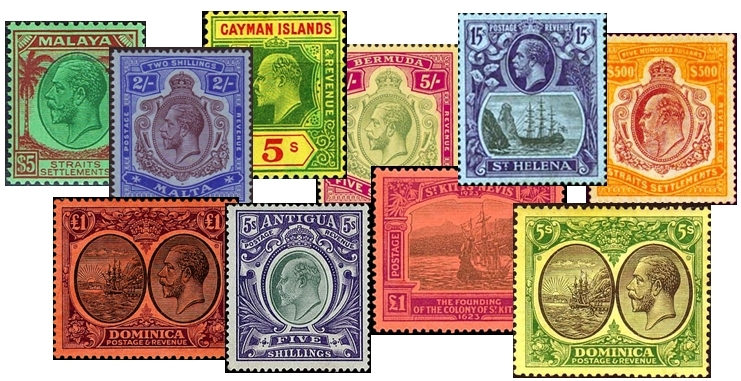 There are many more wonderful examples of the unique coloring effects and combinations used with stamps of the British territories such as the ones below. Again, on some level the appeal of stamp collecting is simply visual. Collecting the bright and distinctively colorful stamps of the British territories is a delightful collecting theme.